The holiday season is upon us, so to help get you in the festive spirit we have scoured the city for the best holiday events that will entertain your whole family. Get your Christmas carols ready and read on to find your next fun holiday adventure. 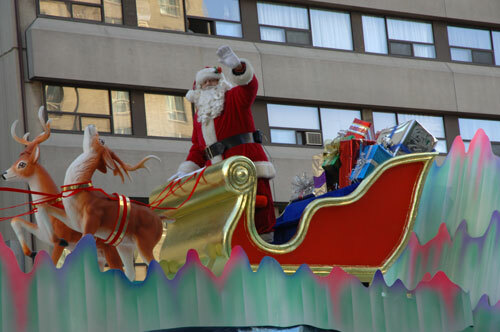 The Santa Claus Parade is back and is the one holiday parade you will not want to miss. With more than 60 marching bands, various community groups, choirs, festive floats, and of course Santa himself, it is the perfect way to usher in the holiday season. Bring some snacks and hot chocolate and take in the festive sights and sounds as the parade travels from Georgia and Broughton streets, down Georgia and Howe, and finishes at Howe and Davie. The parade will begin at 1:00 pm on Sunday, December 6th. For more information about the parade route, how to volunteer, or to donate to local charities via the Santa Claus Parade, visit the Rogers Santa Claus Parade website. The popular Vancouver Christmas Market is back for its sixth year and is the perfect venue to get your fill of holiday cheer. The german-inspired holiday market holds all of your holiday needs whether you are looking for unique gifts, a festive drink with friends, or looking to try some new cuisine. It makes for a great day out and features a kids activity area, traditional cultural activities, live entertainment, a Christmas carousel that is fun for all ages, and beautiful handmade crafts, carvings, pottery, and more. The market is located in downtown Vancouver in the Queen Elizabeth Plaza with tickets costing $8 each with discounts for children and seniors. A one-time ticket purchase allows you to visit the market as many times as you like during the season. The market will be open from November 21st until December 23rd at 11am until 9pm and on December 24th the market will be open from 11am until 6pm. 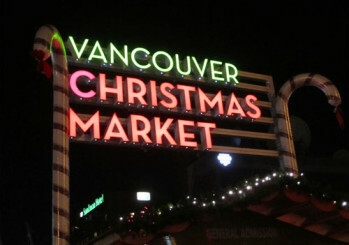 For more information and to buy tickets, visit the Vancouver Christmas Market’s website. 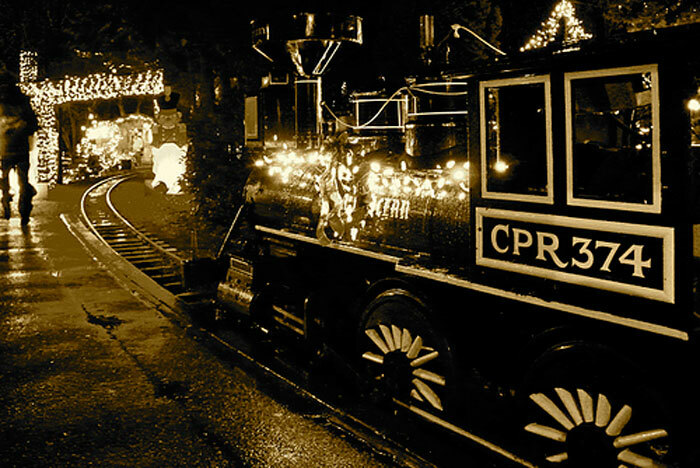 Three million twinkling lights will take your breath away as your ride through Stanley Park on the annual holiday train. The train passengers will ride for about 30 minutes past the brilliant Bright Nights displays, live performances, and into a fantastic holiday atmosphere. Tickets for adults are $12 and $9 for children with a portion of the ticket sales will be donated to the BC Professional Fire Fighter’s Burn Fund. There are both matinee and evening train rides from November 26th until January 2nd. For more information, including hours and to buy tickets, visit the City of Vancouver website. This year’s annual VanDusen Garden’s Festival of Lights will feature over one million Christmas lights and an extra five acres of displays. Some displays will be interactive, including a gnome performance, a dancing lights show, and a performance of the literary classic Tales for a Winter’s Night by the Vancouver Public Library. Santa will be in attendance and there will be some holiday treats to munch on as you stroll through the gardens. Tickets for the Festival of Lights are $16 for adults, with discounts for children, seniors, and families, The event will happen every evening, except for Christmas Day, beginning at 4:30. For more information and the purchase tickets, visit the City of Vancouver’s website. 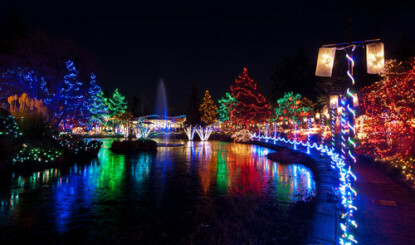 If you are looking for a full evening of festive fun that includes both Bright Nights and the VanDusen Garden’s Festival of Lights check out The Vancouver Trolley Company’s Ultimate Christmas Lights and Karaoke Tour. It’s a three hour trolley tour of Vancouver’s most beautiful holiday lights with Christmas carol karaoke the entire way. This family friendly tour is fitting of it’s name. It really is the ultimate Christmas tour and is often the highlight of the season for many people. There will be a trolley tour every evening from December 1st until the 30th, with the exception of Christmas Day, and spots on the trolley are by reservation only. Tickets for adults are $40 each with children, students, seniors, and family discounts are available. For more information about the tour and to reserve your spot on the trolley, visit The Vancouver Trolley Company website. For a truly memorable and unique holiday experience, check out the Carol Ship Dinner Cruise by Harbour Cruises. It’s a series of two and a half hour dinner cruises where Christmas carollers will entertain you while you dine on chef-created meals and take in the beautiful holiday lights of the city and on the surrounding boats. The cruises are part of a parade of lights that include other private and public vessels, all of which are brightly decorated for the season. This is the only time of year when ships are allowed to have coloured lights on the exterior of the vessel, so don’t miss out on this special tradition. All ages are welcome and singing along is highly encouraged. There are different cruise routes including the areas of False Creek, North and West Vancouver, Deep Cove, and Port Moody. There will be 11 cruise dates from December 6th until the 23rd so be sure to see the Harbour Cruises website for more information, to see the menu options, and to book your tickets. The Vancouver Aquarium is hosting a “celebration of aquatic light” with their exhibit Luminescence. The exhibit features bioluminescent creatures of the deep, including a jellyfish swarm that lights up the entire ceiling, and an interactive floor-to-ceiling installation that lets you “dive” underwater and explore the depths of the ocean without ever leaving dry ground. The exhibit will be holiday themed during December when the ever popular Scuba Claus will be diving in the Strait of Georgia exhibit, showing off salmon, rockfish, sturgeon, and sea stars with a festive flair. There will also be a Christmas tree that is lit up solely using the electricity generated by electric eels, a sight that is not to be missed. The exhibit will be open during regular aquarium hours from November 28th until January 22nd with holiday themed activities only during the month of December. For more information, visit the Vancouver Aquarium Website. If you are interested in a Christmas celebration filled with snow, reindeer, skating, and Santa himself, look no further than Grouse Mountain’s Peak of Christmas event. Elves have transformed the mountain into Vancouver’s very own North Pole, and has activities to keep you going from morning ‘til night. Some highlights of the event include eating breakfast with Santa, voting for your favourite gingerbread village, snow walks through light installations, a magic carpet sliding zone, Christmas movies, crafts, learning about and getting up close to real reindeer, sleigh rides, and outdoor skating under the stars. Phew, that’s a lot! The Peak of Christmas will be running from November 27th until January 4th with the family ticket rate for two adults and two children costing $79.95. For more information and to buy tickets, visit the Grouse Mountain website. 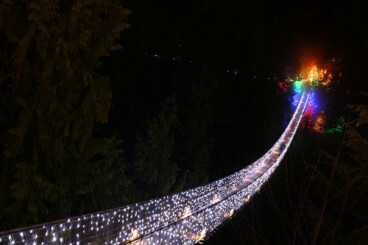 If you prefer to be among the treetops whilst taking in beautiful Christmas lights, head to the Capilano Suspension Bridge for Canyon Lights. Back for its tenth year, Canyon Lights features hundreds of thousands of twinkling holiday lights along the suspension bridge, among the trees, throughout the canyon, along the river, and the Cliffwalk. To add to the holiday magic, there will be gingerbread cookies to decorate, Christmas cards to make, Christmas carols performed live to sing along to, a Snowy Owl hunt, and even the world’s tallest living Christmas tree. This event will run from November 27th until January 3rd from 11am until 9pm, with holiday activities beginning at 4pm. A portion of all ticket sales will be donated to local charities and cost $37.95 for adults and between $12 and $24.95 for children, depending on ages. For more information, visit the Capilano Suspension Bridge Website.